I was unaware that team owner Gary Peterson, who’s Automated Fire Systems company is what AFS stands for was a previous Indy Lights competitor, finishing seventh in the Indy Pro Series back in 2002. 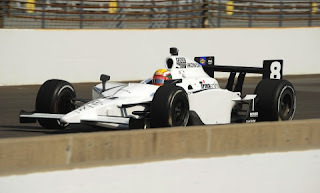 Peterson, in conjunction with Michael Andretti & Andretti Green Racing successfully captured two Indy Lights title back-to-back between 2008-09; first with ‘RAFA, a.k.a. Raphael Matos, and then “Cap’t Frapa Americana,” )Ask either ‘Jeffie or Graham Rahal to explain...) nee J.R. Hildebrand. Thus, talk ‘bout being a hard act to follow for the team’s ’10 drivers Martin “Plowie” Plowman and Charlie Kimball, eh? Although Kimball’s made the leap to the BigCarz this season with the ‘Cheepster’s (Ganassi) satellite squad and Plowie’s seeking a ride in Indy Cars himself currently. Cavin also seems to think they purchased one Dallara from Sarah Fisher Racing, along with a second used chassis from somebody else. And there’s also the rumour of the team having purchased two tubs, which I don’t know if these are just spares or the current chassis in use? Herta’s team partner is Steve Newey, an ex-F1 Engineer, so they should have the technical know how to run these chassis, along with having massively upgraded its driver with this year’s addition of Daniel (“Danny Boy)” ‘SPIKE Wheldon. Recall that rookie Sebastian Saavedra watched from a hospital bed to learn that he’d qualified for last year’s race when everybody else was shooting themselves in the foot by withdrawing their qualifying times. Of course Saavedra’s relationship ultimately soured when he abruptly quit his Day-job with the BHA Indy Lights team and has since moved onto Eric Bachelart’s Conquest Racing concern. And reputedly I thought I heard ‘Kurty claiming that Dan Wheldon & BHA would be doing the ’12 Dallara chassis testing this summer after Indy... So perhaps this is a tune-up for a full season Gig next year? Another team that little seems to have been known when I began scribblin’ this around the Long Beach GP weekend; although I’m guessing Y’all know about the perils of the team formerly known as “Gil’s team,” a.k.a. De Ferran-Dragon Racing, which unfortunately shutdown earlier this year when sponsorship couldn’t be found to campaign new team driver Tony Kanaan. Yet original Luczo Dragon co-founder Jay Penske, son of some Cat known as The Captain, (Roger Penske) has resurrected the floundering team with a five-race deal to campaign ‘PT, “The thrill from the West Hill” – better known as Paul Tracy. Thus, Tracy’s exodus from KVRT left the door open for the younger Penske’s Dragonfly outfit to seek PT’s services, whilst his previous commitment to DRR gave Jay Penske the opportunity to seek another driver to chauffer the team’s ride at 16th & Georgetown May 29th, with whispers of Sam “I AM” Hornish Jr. as a possibility? Instead, I was absolutely shocked by this third generation Upstart when Dragon Racing pulled out a ‘Flyer by announcing its pair of I500 rookies, with Chinese hopeful Ho-Pin Tung being announced as the chauffer of its No. 8 primary ride, and then just days later Scotty ‘THE GOOSE! Speed was announced as the driver of its second entry, the No. 20, as this seems like the Brashest Squad on the Grid at the moment? And while Tracy reunites with Eric Zeto, his ex-Forsythe Engineer for a further four outings beginning at Texas - in his largest part time campaign of six total races this year, Jay & The Dragonflies looks to build for the future; Hmm? Could this become a potential co-ownership deal for The Chrome Horn somewhere down the road? Otay, this is the driver I know the very least about, albeit knowing of his European single seater forays in various series – along with his F1 testing duties. Yet I’ve just watched a very enjoyable video interview with Messer Tung answering a variety of questions which is well worth checking out, as I’d enjoy seeing Ho-Pin dust off fellow teammate Speed this month at the Speedway!